The objective of the following short explanation is not intended to be a scientific lecture on the endocrine system, but is to explain, in general terms understandable for everyone, the influence of our way of eating on this system as well as on our body, our training mode and on our wellbeing in general. The endocrine glands influence the entire functioning of our organism, namely our taste for food and the distribution of fatty tissues. 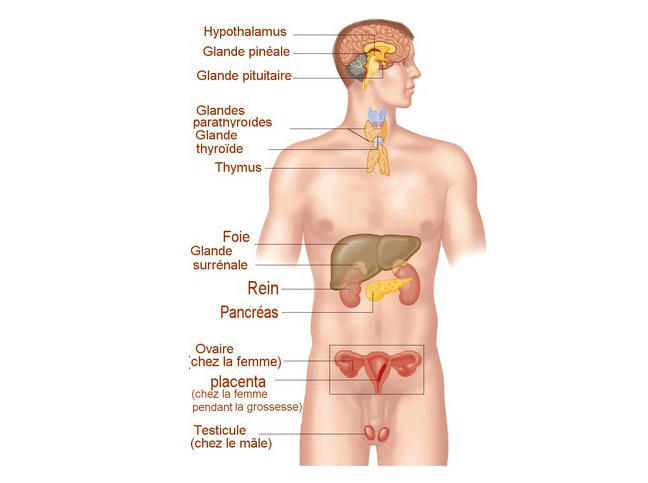 We have two kinds of glands: the exocrine glands (which secrete substances outside our body, such as the lachrymal glands) and the endocrine glands (with internal secretions called hormones which are transported in the bloodstream). Certain glands are mixed. Only four glands are of interest in our context because, although there are nine, they are directly and interactively connected to the development of our bone, muscle and fatty structure, to circulatory problems (cellulite, water retention, etc.) as well as to our moods, our behavior and to our food attractions.